Blue Man Group combines music, technology and comedy to create a form of entertainment that defies categorization and appeals to people of all ages. 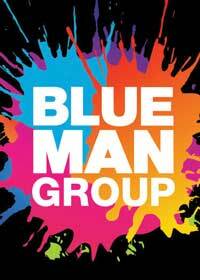 Blue Man Group's shows have been described by critics as "innovative," "energetic" and "wildly entertaining." But the only way to truly understand Blue Man Group's global popularity is to see the show for yourself. "...The Blue Man Group retains a certain mystery, which is part of its appeal. It's almost impossible to describe "Tubes" in a few sentences. It's one of the only long-running hits that audiences will see for the first time without really knowing what to expect." "...An electronic "zipper" with moving red letters sends messages of greetings to the audience, who begin to hoot and holler; some stamp their feet. Drumbeats, like rhythmic thunder, signal the beginning of you know not what, and this most extraordinary and inventive show explodes." "...What is "Blue Man Group"? The simple answer is that it's 90 minutes of non-stop fun. The more complicated answer is that it's a kind of techno-psychedelic neo-vaudeville performance art that is also a satire of performance art. Percussion, painting, videos, eating and spitting out, mime and audience participation are all involved."